Italian Wine Tasting Event Was a Success! 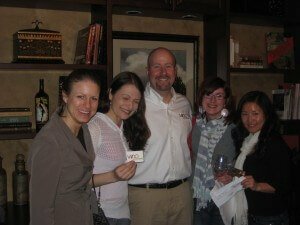 A hearty Thank You to all who were able to join us for our Italian wine event on March 15th. Below is a summary of the wines that were tasted and instructions on placing orders with Vino at the Landing, if you were unable to do so at the event. Pictured here is Vino at the Landing owner, Rick McMaster, along with Angela and friends, the winners of the complimentary private tasting for 4 — congratulations, Angela! A delicious pink sparkler from Northern Italy. Delicate frizzante bubbles with a sigh of pink and a delicate nose of cherry, roses, and the kiss of summer strawberry. Medium gold yellow color. Ripe, with some red fruit sensation, dry hay and nut hull. Solid and developed with a mineral finish. Pairs well with white meat, poultry. 80% Sangiovese and 20% Merlot & Cabernet Sauvignon. Very attractive blackberry and cherry aromas follow through to a medium body, with soft tannins and a lightly fruity finish. 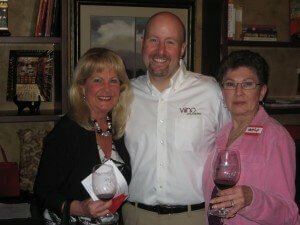 Pictured above is Vino at the Landing owner Rick McMaster, together with Laurie and Beverly, winners of the gift card good for food and wine at Vino at the Landing wine bar in Renton — congratulations, Laurie and Beverly! Dark ruby red in color with intense fruit aromas, especially cherries. A dry, full-bodied and youthful wine. Displays good varietal fruit, flower, and menthol. Ruby red with purple reflections. On the nose, vinous, fresh, harmonious, with fruit scents and underbrush notes. Dry and tasty with a delicate almond nuance. Elegant finish rich in sweet tannins. Perfect with vegetable and meat hors d’oeuvres, delicate pasta, white and red meat, steamed or roasted fish, medium-to-strong seasoned cheese. 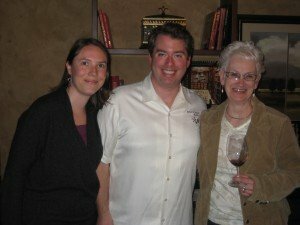 Pictured here is Wine Storage Bellevue owner Patrick and his wife Joy, together with Sandra (pictured right), winner of the 6-months free wine storage from Wine Storage Bellevue — congratulations Sandra! Corvina 75%, Rondinella 20%, Oseleta 5%. Opens with savory aromas of dark spice and black pepper followed by red fruit, cherry, dried apple, plum and raisin. There’s a sweet note on the finish followed by firm, polished tannins. Pairs well with stewed meat, roast of red meats, seasoned cheeses; agreeable also as a meditation wine. If you tasted something you enjoyed and didn’t get the chance to place an order with ​Vino at the Landing at the event, please contact them at (425) 282-0382, or via email at rick@vinoatthelanding.com to place an order.